Janet Lu sat tall at the piano as she opened the evening’s recital with Claude Debussy’s Claire de lune, her favourite score of the French composer and one she has performed countless times. But this performance was to be very different for Lu, a music student at Wilfrid Laurier University. She wasn’t playing in Waterloo at Laurier’s Maureen Forrester Recital Hall. Instead, her music filled the air of the Priory of Chirens, an 11th-century monastery in the town of Chirens, which sits in the foothills of the French Rhône Alps. It was just one of several larger-than-life performance opportunities Lu experienced during her six-month exchange at the Conservatory of Lyon in early 2017. 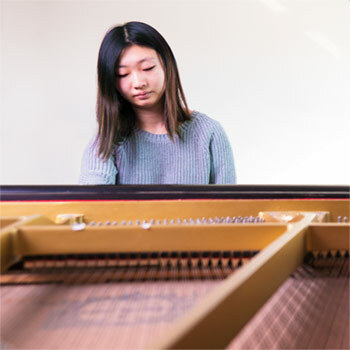 Lu embarked on the study-abroad experience with encouragement from her piano instructor and Laurier Associate Professor Heather Taves. The Conservatory of Lyon is one of two national conservatories in France that offer education in music, theatre, dance and vocal studies. More than 2,400 students study at Lyon and participate in nearly 300 public performances to showcase the exceptional student talent. From January to June, Lu participated in performances in some of the city’s most distinguished venues: the Goethe Institute, a Franco-German cultural centre; St. John Palace, a Gothic palace-turned-library located in city’s fifth district; and the Museum of Fine Arts, where Lu played for audiences in a gallery room with walls adorned by paintings of master Impressionist artists including Claude Monet and Edgar Degas. Acquiring the skillset to study and perform in one of France’s leading conservatories takes hard work and practice. Taves knew Lu had the ability – and confidence – to thrive on the exchange. Exchanges at the Conservatory of Lyon are designed to take place during a student’s third year; their final year of study is completed at Laurier to prepare for a graduation recital and graduate school auditions. In Lyon, Lu received personal instruction from esteemed pianist Alain Jacquon, the conservatory’s director and a piano professor. During their daily 90-minute classes, Lu built on the performance foundations she acquired at Laurier with Jacquon helping her to advance her artistry and technique. More than three hours of practice followed her lessons with Jacquon and the conservatory’s piano education team. When individual practice was complete, Lu collaborated in student-led chamber music ensembles for extra credit. Not quite so familiar for Lu was the conservatory’s performance examination process. Different from Laurier’s private performances for faculty-member judges, conservatory exams were open to all conservatory students and faculty, and included a judge from the Conservatory of Lyon and three from the Conservatory of Paris. “The exams were intense, and the stakes felt so high,” recalls Lu of her first open format examination. Students’ names and final grades are also posted publicly within the conservatory – a practice not exercised at Laurier under Ontario’s Freedom of Information and Privacy Protection Act. Despite receiving a glowing grade, Lu admits it was difficult to have her final mark posted for all to see. But a public facing “review” of her ability is something she will need to get used to if she pursues a career in piano performance. Read more about Laurier’s exchange opportunities.